Philosophy Field Course: Mainstream Salmon - Could an environmentalist ever approve? Prior to embarking on our visit to Tofino, I asked students about what they expected from our visit to Mainstream. None of them had an idea about the site itself. How large? How many fish? What sort of location? Such questions had never occurred to them and I suspect as much is true of the public at large. This creates an opportunity for people with an agenda, either for or against fish farming, to direct people’s thinking by constructing the images for them. It also highlights the importance of experiences like ours, in which matters are investigated first hand. Students did have expectations about the Mr Costello. They assumed that he would emphasize the economic benefits of fish farming while downplaying its ecological impact. My own expectations were similar. I anticipated a well oiled presentation glorifying the virtues of fish farming. My hope was to get past this, if possible, and engage with James and his colleagues on a personal, informal level. As with all of our encounters on this trip, prior expectations were defied. There was no slick presentation. He seemed much more interested in allowing us to look around and ask questions. Nor did James draw a clear distinction between economy and environment. A point also made by Tim Rundle at Creative Salmon is that many environmentally beneficial advances are also economical. In addition, several more subtle points came to light during this meeting. Let me speak briefly on the topics of multinational ownership and First Nations partnership. Then I will close with some thoughts about the cognitive barriers that stand between fish farm advocates and their environmental opponents. People naturally feel threatened by large, powerful corporations. The facelessness and distance that comes with foreign ownership also raise concern about environmental accountability. In the past I have not seen very far beyond these sentiments. However, like a landscape that one stops to appreciate for the first time, I now see details in this picture that were not previously apparent to me. Cermaq is a leader in technological development. Most notably, they are working on a way to bio-manufacture protein for fish feed. Currently this protein is harvested from less marketable fish than salmon– e.g. smelt or herring. Bio-manufacturing fish feed, rather than fishing for it, would dramatically reduce this industry’s ecological impact (as well as costs). This sort of R&D is much more feasible for a large multinational company than a small local operation. I am not saying that these benefits outweigh the costs associated with foreign ownership. My point is simply that the issue is far from back and white. As I mentioned in a previous post, companies like Mainstream are partnering with First Nations. When I first heard of these arrangements, admittedly, I was somewhat skeptical. This struck me as a ploy to win public appeal by capitalizing on First Nations’ reputation as environmental stewards. I now appreciate new details in this arrangement. At one level, industrial partnerships have positive social implications for First Nations. It is about time that the indigenous owners of this territory were consulted about how it is used. Now, finally, they are able to direct the path of these industries instead of standing by on the sidelines. At another level is the economic benefit, both to First Nations and more broadly. Fish farms are a source of training, jobs and economic stimulus. The worry of course is that First Nations partnerships are slanted heavily in favour of the powerful. A skeptic might regard them as primarily for show. Perhaps First Nations are being taken advantage of, losing their good reputation as environmental stewards in the process. How could one know if this is so? One way is to simply look around at what is happening on site. Joining us on our trip was Mr George Frank, First Nations liaison for Mainstream. He explained in broad outline the relationship between the Ahousat First Nation and Mainstream. Ahousat monitors Mainstream’s activities and supports their operation. In exchange, Mainstream employs a certain number of Ahousat people and engages in various forms of community development. I suppose that there is also some financial arrangement among these groups, but that is none of my business. George Frank surveying operations at Mainstream. If George had seemed out of touch with the daily operations at Mainstream it would have raised a red flag about the effectiveness of his role as liaison. However, my impression during our visit was the exact opposite. George was on top of his game. He provided answers to all of our questions, no matter how specific. I also noticed his attention to the details of daily operations as we toured the site together. If anyone knows what is happening on that fish farm, it is George. Let me close this entry with a hypothetical question. I am told that the most outspoken local critics of fish farming have not visited this site nor spoken with these people directly. This leads me to wonder, if environmentalists were to visit this fish farm, would they change their views? My guess is no. They wouldn’t. I see three potential barriers that would prevent someone from even entertaining the thought of a multinational fish farm that is, on the whole, a social and ecological benefit. One reason for resistance stems from a fundamental difference in values. Some environmentalists are opposed to economic development and globalization, no matter what. If this is at the heart of their opposition, then there is nothing that Cermaq could do (besides dissolve) that would make environmentalists happy. A second reason for resistance is scepticism. An environmentalist might simply disbelieve the claims of industry-funded representatives on the grounds of their source alone. Claims about improved farming practices, technological advances, benefits to First Nations, etc would then be ignored. Applied in moderation, scepticism can be healthy. Taken to its extreme, skepticism can lapse into dogmatism. One must not lose sight of the occasions when even one’s opponent shares a common interest in the truth. A third reason for rejecting fish farms, even in the face of what we have seen, is due to the underlying suspicion that there MUST be something wrong with these operations. The harms are lurking out there, even if they are currently unknown. This suspicion sometimes goes under the heading of the precautionary principle: one should assume that industrial activities are harmful until they have been proven otherwise. This idea is easily abused, often by people who are unaware that they are abusing it. What does it mean to prove that some industry is not harmful? Perhaps one requires a scientific demonstration beyond any shadow of a doubt? If so, this is not a standard applied to other industries. In other aspects of food production we happily accept a certain amount of risk. However, when it comes to the unfamiliar, people easily shift to a highly risk averse attitude. Demands are imposed on unfamiliar practices, like fish farming, that would never be applied to familiar practices. For example, you wouldn’t thin k of checking the brakes every time you step into a car. One must be cautious not to lapse into unreasonable suspicion about a practice because of its unfamiliarity alone. So, there appear to be three reasons why someone might fail to recognize the benefits of fish farming, even if they were apparent: (1) fundamental opposition to industry, (2) scepticism about the benefits, and (3) paranoia about unknown unknowns. Identifying and analyzing these points of disagreement is the philosopher’s way of making contributions to this debate. I have suggested that all three ways of thinking lend themselves to excess. Some people become so entrenched in their anti-corporate values that no industry can be seen as beneficial, regardless of what it does. Others become so skeptical of pro-industry information that they close their eyes to valuable sources of information. Finally, the demand for certainty is an unreasonable guideline, that easily gets applied to matters one does not fully understand. I am not sure where I stand on the issue of fish farming in Clayoquot. But I have learned from these experiences to question my preconceptions, and try to avoid these excessive ways of thinking. Stefan, I cannot help but draw some links between this post and the post about our discussion (in an earlier post) on personal relationships and the benefit of developing them to 'get along' in a small town. I agree that these personal relationships are a double edged sword. Time and time again I have seen a person, initially very positional about an environmental issue, get to know people who work on "the other side" and slowly become less positional, and eventually even "change sides." Usually it's not a complete 180 but there is a growing understanding and acceptance of opposite positions. I constantly question myself on this -- is my opinion on this issue changing because of my relationship with this person? In developing a personal relationship, we come to understand our common interests as humans: we want to be happy, to be loved, to feed and clothe ourselves and our families, to feel a sense of pride in our work, etc. 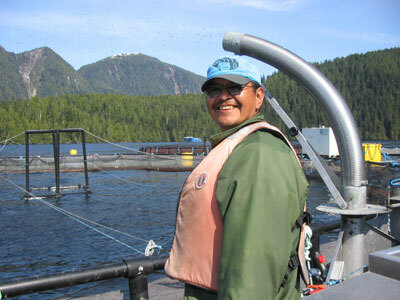 The staunchest fish farm opponent and the life-long fish farm worker share these interests. The danger in developing a personal relationship is that we focus on these interests rather than those that give us different opinions on fish farming. And, we want to 'get along,' especially in a small town. It's not always easy, or possible, to maintain a friendship or a collegial relationship with someone based on your common interests yet respect the fact that you also have different values or interests on certain issues. For example, we misperceive arguments for and against fish farming as an attack on our way of life or our 'right' to feed our families.) And sometimes, the difference in certain values trumps those you hold in common, leaving little to discuss in the grocery store line-up. So maybe it is best for environmentalists (I use that label carefully) not to get too cosy with fish farmers. I wish you had been able to meet Don Staniford. Myself, I perceive him to be an 'outsider' to Tofino and having few personal relationships with people in Tofino, yet he's played a very large role in the salmon farm debate. I would love to know his opinion on the double-edged sword of personal relationships!